Our Concrete Countertops are built utilizing revolutionary applications designed for sustainability and exclusivity. Is it time to update your kitchen or bathroom sinks? With our unique custom concrete we can design beautiful one of a kind creations. Polished concrete will always generate an amazing gloss depth with 30 percent of the grinding steps that are undertaken. Everyone loves to own a space that he can call his own. One of the best ways to create a dream home is by using stamped concrete. Concrete has become the new flooring material of choice for designers and homeowners across the United States. Fixing a crack in a metallic door may seem like a very big job as compared to filling a hole in the wooden door. Whether it is designer metallic epoxy or a floor care system to protect, preserve and enhance your concrete floors. Repair, restore or replace, DreamCrete Custom Creations artisans can individualize your curb appeal with our custom driveways and walkways. Here at Dreamcrete we feel that your patio, courtyard or outdoor kitchen should be your personalized oasis. The popularity of outdoor kitchens has been on the rise in warm climates with concrete summer kitchens topping the list. The addition of a fire or water feature is the perfect accent to your outdoor living area. Other than these we provide many more for commercial and residential services. One of the things that frustrate many homeowners is the appearance of dull or damaged concrete. It can have a significant effect on the overall aesthetics of a home and give visitors a bad impression. If the concrete surfaces in your home are looking worn and dirty, you may want to consider resurfacing them. While it is possible to resurface concrete surfaces yourself, it is best to leave the task in the hands of professional concrete resurfacing contractors.  Concrete resurfacing - DreamCrete Custom Creations in Orlando, Florida is a reputable provider of concrete resurfacing services that is dedicated to offering the best concrete resurfacing services at the best prices. Why You Need Concrete Resurfacing? There are basically two things that homeowners do when they want to refresh the look of their concrete surfaces. They either remove the entire concrete surface and redo it from scratch again or get concrete mix and pour it over the old surface. Starting from scratch can give you good results, but it is quite unnecessary in most situations. Pouring new concrete over old concrete is a bad idea. Since concrete does not have bonding agents, the new concrete will not adhere to the old concrete surface, which can result in crumbling. Concrete resurfacing is the best way to make your concrete surfaces look new. It involves applying a thin cement-based coating with bonding agents over existing concrete. Easy and Time-Efficient: Concrete resurfacing products have self-leveling properties, meaning that you do not have to spend extra time and effort to create a level and smooth surface. We make sure that the concrete resurfacing product is properly spread over the entire surface. Cost-Effective: Compared to other methods of fixing worn and damaged concrete, concrete resurfacing is a lot more cost-effective. Concrete resurfacing cost can be two or three times lower than the cost of ripping out and replacing existing concrete. We will charge very reasonable amount for our services. Aesthetically-Pleasing: There are many concrete resurfacing options for you to choose from, in terms of colors and designs. Concrete resurfacing products can be tinted with colorants or stamped with finishes and patterns, allowing you to customize your concrete surfaces to complement and enhance your home décor. Resurfacing concrete porch and steps with well-chosen colors and designs is a great way to add flair to your home. Durable: Outdoor concrete surfaces are constantly exposed to the elements, making them more vulnerable to stains and damage. Exterior concrete resurfacing enables you to keep them in a good condition for many years. Our concrete resurfacing products are highly durable and stain-resistant, and they are likely to last much longer than the existing concrete surfaces in your home. As you can see, there are many good reasons to implement concrete resurfacing. If you want to get the most out of concrete resurfacing, it is best that you hire us professional concrete resurfacing service provider. DreamCrete Custom Creations in Orlando, Florida (driveways, patios, pool decks, walkways, walls) has extensive experience in helping Modesto home and building owners resurface their concrete surfaces, and it has achieved a high level of customer satisfaction over the years. If you are looking for affordable, efficient, and satisfactory concrete resurfacing services, do not hesitate to call us. That space that you have created at the back of the house that looks like an uncovered porch? Yeah, that is a patio. It is a great spot for resting; chilling out after a long day, having a drink under the star lit sky you get the drill. Seeing as your patio is for entertaining guests and for relaxing with family and friends, the style and surfacing you choose for it has to be picked with much deliberation and forethought. As far as home decorating projects for, furnishing your patio is probably even more fun than picking furniture for the living room. Picking out chairs, pot plants, tables, creating structures for hanging vines, everything can be loads of fun, even when you are on a budget. You can hire DreamCrete Custom Creations in Orlando, Florida for patio resurfacing and other patio remodeling designs. DreamCrete Custom Creations in Orlando, Florida caters concrete services either construction or repair from sidewalks to driveways to patios and slabs. The most common services are drive way repair which they remove all old concrete and replace with fresh concrete, sidewalk repairs where DreamCrete Custom Creations in Orlando, Florida fix the cracks along the sidewalk and the patio construction that repairs, extends and constructs home patios to improve outdoor space. Contact us today if you need any of these services. The family business specializes in stamped concrete, colored concrete, stained concrete, decorative concrete, and regular concrete. Included in their available for installations are for patios, walks, drive, and raised patios, patios underneath wood decks, interior flooring, and countertops. DreamCrete Custom Creations in Orlando, Florida works hand in hand with the homeowners, and architects to produce unique and one good looking concrete service. What is also nice about the DreamCrete Custom Creations in Orlando, Florida is the unlimited design offered for patios and drive ways. More than this, customers can request for custom designs of their taste that will fit their place. Each output and service is a product of the contractors’ and the clients’ collaboration. Whichever choice, like mentioned above, resurfacing is a great investment and will make families start going out the house for that relaxing vibe and beautiful effect of the concrete patio. More time spent with the family and at home. For nice looking homes and elegant commercial spaces, concrete pathways, sidewalks and driveways are now in the trend in every country and places. Just contact us today and we will do everything for you. The word Epoxy refers to a sticky substance used to stick one thing to another using epoxy resin. Epoxy resin on the other hand is a tough synthetic resin, containing epoxy groups that set after the application of heat or pressure. Now look at the words ‘heat’ or ‘pressure’. Do they ring a bell? Epoxy included in the paint actually makes it a thermosetting resin that acts as a coating. What makes these ‘Epoxy paints’ much more durable than others? Now because they are coatings, when properly applied, they produce a hard, solvent resistant finish that would automatically suit the floor of a typical garage. Not only would they give protection from friction created from contacts with wheels and all sorts of property stacked up in a typical garage, but they would also give the floor and thus the entire garage a new look that makes it stand out from the ordinary bleak looking, dull floored garage, that is characteristic of most homes. Before we take a further look at the obvious benefits of Epoxy painting and why it should be used on a garage floor, a brief tour of how it can be used or applied would be necessary. Now the first point of consideration would be how to start off. First read the manual that comes with the paint. In doing so, you save yourself loads of stress and errors from wrong applications, as well as creating the avenue to get in touch with the distributor or sales representative from whom you purchased the paint, if there are instructions that are not clear enough . Secondly take into consideration the state of the floor before painting. Are there cracks or other faults that you need to repair? But before that, clean up any moisture noticed. Expose the pores of your floor as well, before repairs. The essence is to make sure that your floor has a smooth and flat surface before receiving repairs. Epoxy paint applied to faulty floors often gives a nasty look that would make your work look horrible. If you have just laid new concrete on your garage floor, it would be wise to allow it cure for at least twenty eight to thirty days, before applying your epoxy paint. Thirdly, consider the number of people that can carry out a floor Epoxy painting at the same time. A good number would be two people for a start. You can hire us for epoxy and we will take care of everything that you need. This goes a long way in preventing errors that can arise from painting carried out by one person. This could be from factors arising from exhaustion, dizziness, especially if you are sensitive to the smell that emanates from a bucket of paint. You wouldn’t want to look back after about an hour’s work and see patches of paint crisscrossed behind you, trust me. It would not be hilarious at all. Another reason for the number is the amount of time used in the work, more hands, less time. An individual painting a garage takes an average of two to three hours depending on big the garage is. More hands would take less time; an hour, or even less. We have a team of trained professionals and we can do it within very less time. Necessary tools needed for painting include 3 inch brushes, latex gloves, and heavy duty painter’s tape. Others include; rollers, gallon pails for mixing your paint, rags, standard paint tray and liners, rags, spiked shoes, acetone (for clean up), Tarp (for mixing), Variable speed drill, Plastic drop cloths. Calibrated containers for mixing paint meant for smaller sections. If you need any of the above mentioned services then do not hesitate to contact us. We have got years of professional experience.